Ace Piano services pianos in Oakland County, Michigan, and many cities surrounding Oakland County. When I moved into the Metro Detroit area over thirty years ago and started my piano tuning company I had no idea what cities I could service and what cities and communities were just too far to travel, so I answered the phone and said, “yes, I service your area.” I love what I do, so a bit of travel time is not bad when you consider the wonderful clients I have met over the years. As the years have gone by, I have refined my piano service area a bit, but I still say yes most of the time. My main service area is ALL OF OAKLAND COUNTY MICHIGAN. 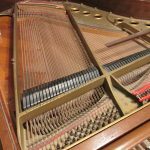 I tune and repair pianos in cities including; Troy, Rochester Hills, Rochester, Auburn Hills, Waterford, Lake Orion, Clarkston, Bloomfield Hills, West Bloomfield, Southfield, Livonia, Royal Oak, Huntington Woods, Novi, Northville on a daily basis. I tune pianos in communities outside Oakland County such as; Grosse Pointe, Sterling Heights, Macomb Township, and communities to the west such as South Lyon, Milford, Brighton, Plymouth and Canton. All the areas listed are not charged for travel time or mileage. All clients in these areas pay a flat rate for tuning. My name is Craig Cole, I am the owner/piano technician of Ace Piano Inc.
I’d love the opportunity to help you with all your piano service and repair needs.